The business community in Washington, DC, welcomed investing in SEZD. Seward L. Jones, Assistant Undersecretary of Commerce, said that the ministry encourages American companies to invest in Duqm and establish strong relations with the business community in the Sultanate. This came during a meeting between H.E. Yahya bin Said Al-Jabri, SEZAD Chair, and officials from the US Department of Commerce in the presence of H.E. Hunaina bint Sultan Al-Mughairy, Sultanate's Ambassador to the United States of America. SEZAD reviewed the investment opportunities available in SEZD to the business community in Washington through meetings with a number of American companies and senior US officials. The meetings held in the American Chamber of Commerce, the Ministry of Commerce, and the US-Arab Chamber of Commerce witnessed a good presence of representatives of about 50 American companies. During the meetings, SEZAD delegation reviewed the investment opportunities available in Duqm, SEZD potential, the infrastructure, the current projects and the incentives provided by SEZAD to investors. H.E. Yahya bin Said Al-Jabri, SEZAD Chair, confirmed that he welcomed the US investments, stressing that SEZAD encourages American companies to invest in Duqm. He pointed out that SEZD geographical location on international shipping lines and facilities provided to investors renders it an ideal choice for American companies, stressing that Duqm includes various investment zones, including heavy industries, petrochemicals, medium and light industries, as well as tourism, trade, real estate development and services Logistics and oil storage. During the meeting, Al-Jabri praised the good relations between the Sultanate and the United States of America, and the efforts of the two countries to develop them in various fields, especially in the economic aspect, noting the free trade agreement between the Sultanate and the United States signed in 2006. For his part, Steve Lotus, Vice President for Middle East Affairs at the American Chamber of Commerce, expressed his desire to strengthen relations between the Sultanate and the United States of America and to establish economic partnerships between American and Omani companies, noting the economic advantages enjoyed by SEZD. Lotus indicated that there is a good interest from the US companies to invest in Duqm and stressed that the American Chamber of Commerce is looking forward to organizing a visit to Duqm for American companies to get a closer look at SEZD and the projects implemented therein. 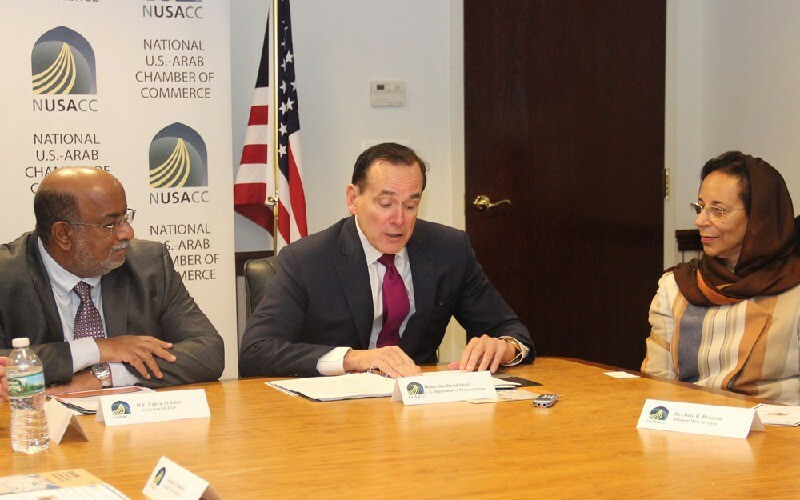 The last day of the promotional campaign in the United States of America witnessed several meetings between SEZAD delegation and representatives of American companies that attended the meeting held at the US-Arab National Chamber of Commerce. David Short, Deputy Assistant Secretary of Aviation and International Affairs, US Department of Transportation, noted the relationship between the United States of America and the Sultanate, calling on American companies to invest opportunities in SEZD. He pointed out many factors that support the strategic partnership between the Sultanate and the United States of America, such as the free trade agreement between the two countries, the open skies agreement and the diversified Omani economy. He stressed that the infrastructure projects in Duqm are a long-term investment by the Omani people.